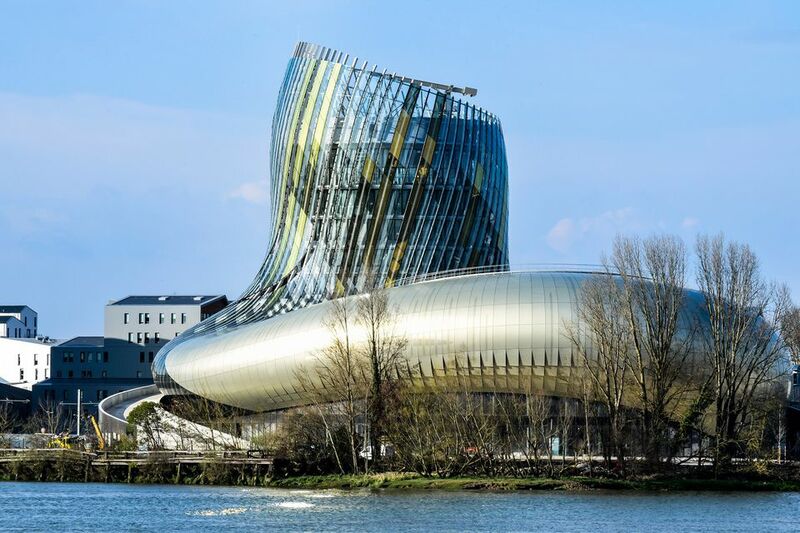 The brand new iconic Cité du Vin in Bordeaux aims to be the world’s first successful wine experience. It provides an immersive, fun and gently educational tour through the world of wine, from 6,000BC to today. Aimed at those who want to learn more (and that includes families), it has some pretty nifty high tech devices and works very well indeed. It's been some years in the making and is the result of unparalleled co-operation between Bordeaux wine makers and those from around the world. Over 100 advisors from over 40 countries have made this a truly international museum. There is also a fabulous Belvedere wine bar on the top floor, giving a panoramic view over Bordeaux. It's been designed by the French architectural company, XTO, with the exhibitions designed by the British firm Casson Mann whose credits include work at the Victoria & Albert Museum, Design Museum, Natural History Museum and Imperial War Museum and who are currently working on the new Lascaux IV visitor centre in the Dordogne, due to open late 2016. You can’t miss the Cité du Vin as you take the tram beside the river Garonne. In what was once the manufacturing district, the new building swirls skywards, its gold and metal panels catching the sun. Once inside you start the tour of the 3,000m² space. There are 19 different themed areas, but they meld together so seamlessly you don’t realise how much you are absorbing and how wide spread the experience is. Start with a World Tour of the vineyards. Huge images are projected onto the walls and floor, while, seemingly in a 50-seater boat, you travel the great river and ocean routes used by the wine traders from the ancient Greeks and Romans to the Dutch who took over the Bordeaux wine trade going as far as 17th century Japan. The idea is to show the vast world of wine which we think of as encompassing the known wine producing countries in Europe and the Americas as well as lesser known countries like Romania, Georgia, Mexico, Japan, China, Bali, Thailand and more. All the major themes are tackled here in a very new way. You step inside stainless steel, oak and glass structures to see how wine is made; you spin globes to discover where wine is made; you sniff the fragrances in different wines; you stand in front of a huge screen showing a banquet where figures like Voltaire, Churchill (who was a well-known imbiber, particularly of Champagne), Napoleon and Colette tell you stories of long-gone wines; you sit and listen to expert wine makers, chefs and more talk about their favourite wines and why they like them. The Cité du Vin takes the more nebulous theme of our relationship with wine which has inspired some of the great works of art, literature, music and cinema, as well as leading to excess and despair. The art of living is explored through table-top animations of wine and gastronomy; how it was served in the past and celebrating its great qualities of conviviality. Divine wine takes you through the relationships between wine and religions through world history. And of course there’s the importance of the wine-making region to Bordeaux’s history, with touch-screen tables revealing the city and vineyards of Bordeaux and the South-West, plus a great film showing how the great wine region surrounding Bordeaux made it such a vital, and important, place in the story of wine.You end in the Belvedere on the top floor to taste one of 20 wines which change regularly from all around the world. What else is there at the Cité du Vin? There's more to the Cité du Vin than the main exhibition space; it’s designed as much for locals as for visitors. On the ground floor there’s a wine shop with wines from 300 vineyards in France (140 from Bordeaux) and the rest from 76 countries around the world, making a total of 800 vineyards. The shop sells bottles from the relatively modest to the most expensive. You’d expect the Pétrus – at 2590 euros a bottle, but you probably don’t know the other top wine at the same price – it comes from the U.S. Napa Valley Screaming Eagle vineyard and is one of the original California ‘cult wines’. You can get some vintages in the UK from Berry Bros & Rudd, where a case will set you back from £6,272.60 to £6,341.00 (but they are magnums and only 500 cases are produced a year under the female wine maker, Heidi Peterson Barret). On the 7th floor, you can eat a gourmet meal in Restaurant Le 7, enjoying the views over this rapidly changing area and on to the rest of Bordeaux from inside or from the open-air terrace. But you’re really here for the cooking of Nicolas Lascombes who uses local seasonal ingredients but whose cooking is inspired by international cuisines. Match wines from 50 countries and from 500 bottles on the wine list. Also check out the express cookery courses (30 minutes) offered from Monday to Saturday with the chef and the sommelier. Latitude 20 is the more casual eating and drinking place, taking in a wine cellar, wine bar and snack bar. The cellar has more than 14,000 bottles of 800 different wines with 200 from France and 600 from more than 80 countries in the world. The wine bar, open for lunch and dinner, offers food accompanied by a selection of 40 bottles by the bottle or glass. The snack bar is open through the day and is more than just a snack bar with some pretty nifty dishes and global tapas on offer to eat there or take away. As you're next to the Garonne river, it's the perfect place for a picnic by the water. The name Latitude 20 refers to the extreme vineyards in the New World between the 20th parallel north and south which produces wines from places like Bali, India, Madagascar, Ethiopia, Brazil and Tahiti. A comprehensive library is open to everyone with books in several different languages on wine. There’s also a garden outside along the river which anybody can access. It’s divided into four sections and is an ideal place for a picnic. Or you can go to the long pontoon on the river bank to take water shuttles to vineyards along the river. Book for these and for wine tours at the Wine routes information area on the ground floor, run by the main tourist office. While almost all the technology can be found in other museums and attractions, this is the first time it’s been brought together to produce an experience (don’t call it a museum; there are very few artefacts). The most obvious high tech innovation is the hand-held travel guide, like a smartphone, that you take around with you. Instead of entering a number, it triggers the animations you’re seeing and gives you the drama and words in whichever of the 8 different languages you want. It does this via an optical process based on infra-red detectors or via a motion detection system based on cameras. The complexity of the system required the development of specific gateways between this equipment and the audiovisual and multimedia devices. These gateways mainly use CAN bus technology, usually used in car manufacturing for mass processing of signals from a variety of equipment. Attached to your hand-held guide is a new ‘open’ headset which hangs around your ears and gives great acoustic performance. The hand-held guide is also designed for the visually impaired and hard of hearing, giving commentary and visual and text adaptions of what you are facing. 7 Medialon show controllers orchestrate and monitoring broadcasts Spotlight on the hand-held guide. Open June-August daily 9.30am-7.30pm; September 1-30: Mon-Fri 9.30a,-7pm; Sat, Sun 9,30am-7.30pm; Oct 1-31: Mon-Fri 10am-6.30pm; Sat, Sun and school holidays daily 9.30am-7pm; Nov 1-Dec 31 Tues-Sun 10am-6pm. Where is the Best Shopping in Calais?